As seasons go, the 1992 regular season was a difficult one to top dramatically. After starting 0-3, the team had won its last eight games ... throwing in a championship, won in overtime, on the road. The challenge of the season, then, was to follow that act. The cast of characters was generally unchanged. John Tavares, Derek Keenan, Bob Hamley, Darris Kilgour, Jim Veltman, Kevin Alexander, Ross Cowie and Bill Gerrie were all back. Among the arrivals, Troy Cordingly fit right in as a second-round draft choice. Jon Lantzy was acquired in mid-October from Detroit for Gerry Hiltz, who couldn't get off from work in Peterborough, Ont., to drive to Buffalo for mid-week practices. Stu Aird was a 35-year-old rookie who spent his days working as a lawyer in Hamilton, Ontario. Plus the team had a new coach ... sort of. Les Bartley was elevated formally from assistant coach -- even though he essentially had been the coach since Game Four of the 1992 season -- after the team announced on September 14 that Bob McCready was dismissed from the job. No explanation was given. "He was an innovator," Keenan said later. "Prior to that, the game was very much a read and react game. You didn't prepare as much as we do now. He was the first guy to do that. I remember, he'd come to practice and he'd have film from the Empire Network. We'd be like, 'We're going to watch film?' "
The fans were certainly ready for the new season. Season-ticket sales went from 1,100 to 8,400. "It's just exciting for me to go out there and warm up with about 5,000 people in the stands," Tavares said then. "You go back and change, then come back to the floor and get hit with that roar from 16,000 people when the spotlight hits you. It's like nothing else." "Everybody will be making their game plans, gearing them to knock us off," Bandits General Manager John Mouradian said. "And in this league, anybody can be a challenge to anybody on any given night. I think our guys understand where we are." Buffalo started the season with wins in Pittsburgh and Detroit, and came home to a sellout crowd in Memorial Auditorium to thump Baltimore, 23-13. The Bandits' closest calls came against Baltimore (Alexander scored an overtime goal to win it) and Philadelphia, when Buffalo was given a minor penalty while nursing a 13-12 lead with 1:52 left. Cowie bailed out his teammates with some big saves. "There was no anger at the time, I told myself it was time to gear down and focus," said Cowie. "I knew we'd still defend. They had to get it past me and the net is only so big. But at the buzzer it was a feeling of absolute relief. I was dead tired. I don't know what would have happened had the game gone to overtime." There was no stopping the Bandits from that point. They swept through the regular season to finish 8-0, with every home game a sellout. The final game was a 20-14 win over the Detroit Turbos at home. Keenan had five goals and two assists. "I guess we really just don't like those guys very much," Keenan said at the time. "They're pretty arrogant for a team that's 3-5. We don't have a lot of good feelings for them and we carried it out on the floor." For the season, Tavares had picked his game up, scoring 35 goals and 23 assists in the eight games. Keenan had 22 goals, while Hamley, Kilgour and Alexander were also in double figures. "We could score goals like nobody's business," Keenan said later. "We weren't great at defending. We just outscored teams. But when it came down to crunch time, I thought we were actually very good at defense. We had a group that could adapt to what we needed." Cowie saw most of the work in goal, recording a 6-0 regular season record. Tavares and Veltman were named to first-team all-league, while Keenan was picked for the second team. "We could win in different ways," Tavares said. "We could use a defensive style, an offensive style, a rough style, a transition style. We were a loaded team. Back then there weren't as many games, but they seemed more intense. You got away with more physical play. It was a lot of fun." All of that talent pushed young players like Rich Kilgour and Troy Cordingley to the background. But they weren't in a position to complain. "Troy and I sat on the bench a lot that year," Kilgour said. "We were the odd men out. I remember Troy being such a competitor and wanting to contribute. ... But, were we going to be more undefeated with me in the lineup?" The playoffs figured to be something of a coronation, although not a particularly easy one. In the division semifinals on April 3, Boston gave the Bandits trouble before falling, 12-10. Keenan had four goals. "This team is just a bunch of winners," said Buffalo's Bill Meagher. "It's just something you know, something instinctive. I guess it comes from having talent and a lot of heart to go with us. That's what got us through." Then in the final on April 10, the Bandits earned the chance to host the championship game against Philadelphia not via their record, but because of attendance. The game went to the team that had the most fans during the regular season, and the Bandits qualified.Those fans might have seen the most talented teams in the history of the league battle for a title. "I'm sure someone could argue that," Hamley said. "It was second to none at the time. ... It was an honor just to be a part of it." While the Bandits were loaded that season, the Wings weren't far behind. Paul and Gary Gait, two of the greatest names in lacrosse history, were Philadelphia's leaders. Goalie Dallas Eliuk was another standout. Six players made the first-team MILL All-Pro teams that year, and five played in that game. The teams had a combined record at that point of 17-1. Memorial Auditorium was littered with Hall of Famers; even one of the reporters - the Buffalo News' Tom Borrelli - was eventually inducted. The game lived up to the hype. 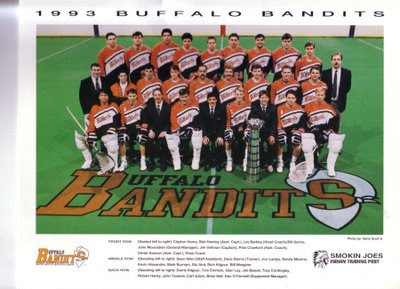 As a starter, Paul Gait scored the game's first goal, and had it challenged by the Bandits for using an illegal stick. When the ball didn't fall out of Gait's stick when turned over, the goal was wiped out and Gait was given a penalty. "I thought it was brilliant that Les pulled the illegal stick challenge," said Bruce Wawrzyniak, the team's public relations director at the time. "To do it against a Gait was almost an insult." Gait came out of the penalty box, and promptly got into a fight with Tavares. It was that kind of night. Both teams had some runs during the course of the game, but neither side led by more than two goals. This was an era where teams used lines instead of offensive and defensive platoons. That meant extra work for two Bandits veterans. "People forget we played both ends," Hamley said. "Give Keenan and Veltman credit - they had the task of shutting down the Gaits. Les had them matched up. That's unheard of today. It would be like Colin Doyle and Josh Sanderson checking John Grant Jr. and Adam Jones (20 years later). It['s not easy." Philadelphia took a 12-11 lead with two ticks less than two minutes left. That was more than enough time for one last rally. Alexander, in his last game as a pro, scored a spectacular goal to tie the contest. Then Keenan drew a penalty from Chris Flynn of the Wings, giving Buffalo a power play. Bandits fans can still visualize what happened next. Darris Kilgour already was known for one of the hardest shots in the league. He launched a laser from Eliuk's right that seemed to go through the goalie with just less than 30 seconds left. "I was actually lucky. My stick hooked. Dallas was all over it, but he jumped so hard that he lifted his arm and it went under his arm," Kilgour said about what he called his favorite type of shot. Keenan added, "He loved to shoot the ball hard. I remember how Kevin and I were always telling him, 'You don't have to try to kill the guy.' Sure enough, that goal, he put it through Dallas. He hit him, and it was too hard for him to stop. ... We joked about it after the game." There are people at that game who still believe that Memorial Auditorium was never louder than it was at that exact moment. "That building was very intimate, a great place to play - a fire hazard, but fun to play in," Tavares said. "The fans were right on top of you. ... I loved playing at the Aud." But there was still unfinished business. The Wings set up for one last shot in the final moments. Tavares, later picked as the game's most valuable player with four goals and three assists, intercepted a pass and rolled it down to the other end of the field. By the time, Philadelphia retrieved it, the Bandits had started to celebrate their second straight championship. "I think one of the reasons this team was so successful was its ability to take things one at a time," Bartley said after the game. "Our guys took it one game at a time, one half at a time, one quarter at a time. Sometimes they were able to break it down to one shift at a time. They knew what they needed to do to be successful and they went out and did it." About 1,500 fans turned out for a rally in Lafayette Square for the team. April 24, 1993 was "Bandits Day" in Erie County, as proclaimed by County Executive Dennis Gorski. "It was all about a winning attitude," Aird said. "We never really felt down when we were down. We always felt that when it came right down to it, we'd put the ball into the net when we had to. And we did." Twenty years later, it was still the only perfect season in the league's history. Keenan didn't see that happening again any time soon. "I think we'd need more teams for that to happen," he said at the 20th anniversary of the season. "It's so competitive. A .500 record is a good record now. Three or four games above that is a great record. I can't see that happening." Let's see - 10 games, 10 wins (an 18-game winning streak over two seasons), six home sellouts. Perfection. "We're not the 1972 Dolphins. We don't get together and crack open a bottle of champagne every year (when the last unbeaten team has lost), but it's something everyone likes on their resume," Rich Kilgour said. "That team refused to lose that year."